[Acne Story] #03: Update on My Acne Journey — "Clearing Up!" In the previous update on my skin condition, I mentioned about my skin broke out again. If you have not read it, you can read it here: [Part 1], [Part 2]. So let's continue from where I left off, shall we? A quick update — PART 3! I guess most of you are familiar with the Taiwan brand — "My Beauty Diary". It offers a great variety of sheet masks (facial & eye) at an affordable price and is the No. 1 selling mask in Singapore, Taiwan & Hong Kong with over 100 million masks sold in 2011 and growing! If you are new to this brand, you gotta try their masks! You'll love it! My Beauty Diary has recently launched its NEW Black Mask range featuring three exquisite variants — Black Obsidian Moisturizing (blue), Black Rose Brightening (pink) and Black Pearl Total Effect (gray) Black Masks. [Acne Story] #02: Update on My Acne Journey — "Breakouts"
In the last update on my skin condition, I've shared on the return of my acne after ~six months of pretty clear skin and well, I am supposed to update my acne breakout weekly or bi-weekly...hmm...but I failed. lol. Here goes the update .aka. part 2~! We all know exfoliation is beneficial to the skin. However, exfoliation isn't only important for your face. It is also important for your body as well! The secrets to soft, dewy and healthy skin begins in the shower. Here I have with me The Body Shop's Spa Fit Smoothing & Refining Body Scrub (200ml), which I received as a gift for Christmas last year. 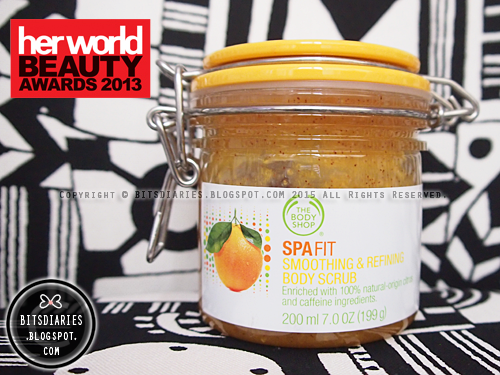 It has been awarded the Reader's Choice for 'best body scrub' in Her World Beauty Awards 2013. This zesty citrus scrub contains 100% natural-origin citrus ingredients (orange, lemon, lime = rich in Vitamin C), sesame seed oils, honey and caffeine ingredients, which refines skin’s texture leaving it looking smoother and feeling firmer.